With its whimsical words of wisdom, upbeat designs, charming color palettes and delightful textures,this day-brightening collection of carved printed accent rugs will bring a fun-filled flair to any environment. These versatile machine-washable, non-skid rugs are beautifully durable, easy to maintain and terrific for high traffic areas. 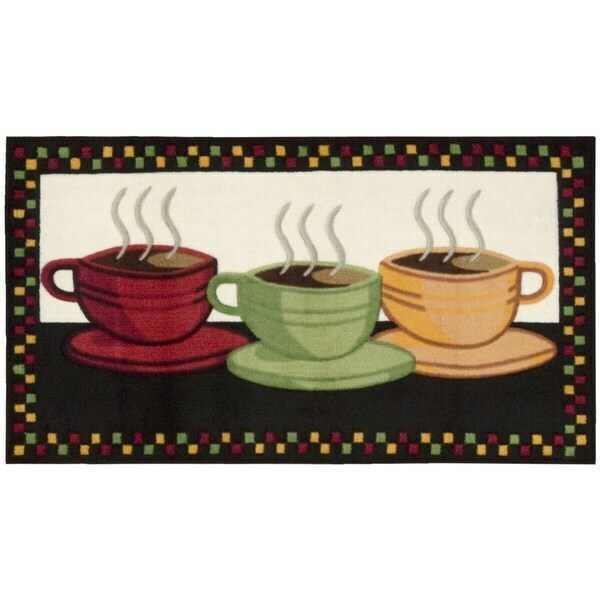 This rug is made very well, it is thick it is a pretty rug and The colors are vivid! .I am very satisfied with it. Colors are exactly what I was looking for. Rug seems to be great quality. Would recommend. It is very whimsical and adds a great splash of color to my ktichen. The color in the picture was a perfect match to the real rug. This is a cute rug. It added the needed color and the cups are cute. A very nice quality for the money. Buy this rug. The rugs came out exactly what I needed for my kitchen, I was surprised at how big the rugs were than the caption. I love the colors and I'm completely satisfied! Unbelievably, I still haven't put this down on my floor since I bought it. But I love the softness and height of the pile, and I know that the rug will be a very sweet addition to my kitchen, as the coffee cups have just the right pop. It's very well made. Very nice addition to my Kitchen, I have already washed it and the colors held up really well! Larger than I expected, but looks great in our kitchen! Love the look, but it hasn't held up as well as I would've liked. The backing is deteriorating after a few washings over the past year and a half. I have coffee theme in kitchen. Every sugar-crashing kid and exhausted parent deserves a fluffy surface to collapse upon. Enter the cuddle-worthy area rug. If you’ve been wondering how to get a hold of one of the softest rugs ever, you’ve come to the right place. We’ll show you that it’s possible to treat your feet without draining your bank account. These are the five most comfortable rugs that are sure to add touchably soft luxury to your living space.